Singing our "anthem" Ode to the Elbow at our 20th anniversary celebration performance at the Yarmouth County Museum, joined by two former members. The Shantymen open the Fish Aid Festival: Yarmouth, August 1998.
cheer to the Yarmouth Farmers' Market. Even Santa wants to be a Shantyman! Sometimes we actually get on a ship! Before the Mast of Saint John, New Brunswick The Yarmouth Shantymen began somewhat accidentally. 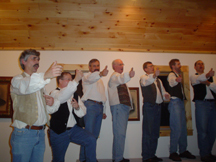 In 1984, Eric Ruff, then Curator of the Yarmouth County Museum (retired 2005), asked a number of musical friends to accompany him to illustrate a talk on sea shanties at the museum. Sea shanties are rhythmic work songs used by centuries of sailors to coordinate their pulling to hoist sail and cargo, and to perform other tasks onboard ship before the age of steam. This was to be a "one-time" gig! Years later however, the group is still going strong. The crew of ten on that auspicious first voyage consisted of Eric Ruff , David Sollows, David Mahoney, Wayne Robicheau , Lloyd Prosser, Stephen Sollows, Christopher Allworth, Oliver Bonham, Don Soucy, and Peter Zavitz. Living in Yarmouth, Nova Scotia, an Age-of-Sail shipping port and, now, an active fishing port, made it easy to love the time-polished melodies and worldly-wise lyrics. After a return presentation at the Museum, we became The Yarmouth Shantymen. Four of those charter members remain: Eric Ruff, David Sollows, David Mahoney, and Wayne Robicheau. Those who have replaced originals are: James Colbeck, Brad Fulton, Bob MacConnell, Gordon Rothwell, and Jim Rideout. Others who have sailed with us for a time are: Stuart Bradley and Mike Mason. Mark Pitman was a long-time crewman who marched inland in 2007, leaving Mark Palmer to stand his watch until he signed off in 2015. In 2009, James Colbeck, another old hand, decided to sail the Great Lakes and moved to Ontario; his hammock was filled by Ed Kennedy. left to right: Bob MacConnell, James Colbeck, Lloyd Prosser, Wayne Robicheau, David Mahoney, Brad Fulton, and Mike Mason. The Shantymen perform in a variety of venues for diverse gatherings. We can be found singing at the local "Fish Feast" celebrations during SeaFest each July, participating in community events such as Canada Day, entertaining a tour bus crowd in a local hotel dining room, performing for participants at a conference, and occasionally singing just for fun on Yarmouth's historic waterfront - this last usually followed with a visit to the brew pub on the wharf! 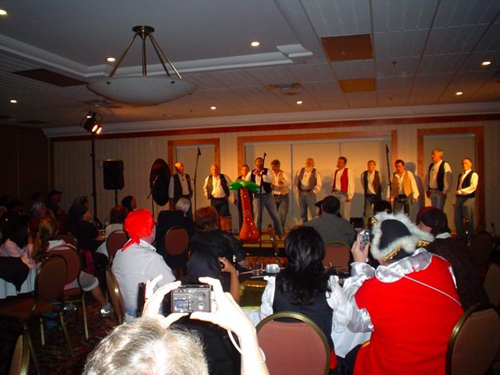 Some of the groups for which we have provided a lively source of entertainment are: the Association of Nova Scotia Municipalities, the Nova Scotia Chiropractic Society, Nova Scotia Block Parents, the Swedish Women's Hockey Team, and the Nova Scotia Women's Golf Championships. We have travelled as well, joining in the festivities at the Mahone Bay Wooden Boat Festival, the Lunenburg Folk Harbour Festival, and the "Pirates Brannigan" at the Explore Oak Island Days, as well as giving concerts in communities between Yarmouth and Halifax. 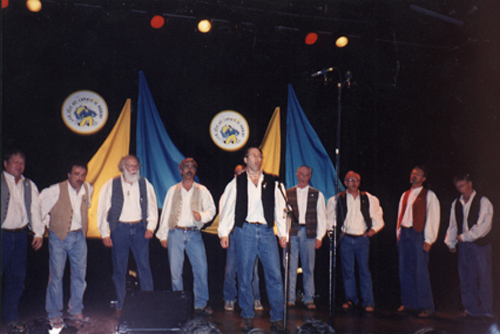 We have done exchange concerts with Before the Mast, a fine shanty group from Saint John, NB, in Yarmouth and New Brunswick, and have represented the province of Nova Scotia on the waterfront of Bar Harbor, Maine, and joined with other international performers at La fête des chants de marins in Saint-Jean-Port-Joli, Quebec, in 2003. Practices take place in the home of one of the guys, generally the cosy office of our "captain", Eric Ruff. Vocal chords are kept moist with a small quantity of beer as old favourites are reviewed and new tunes are brought to the group by the one who will be the shantyman for the number. 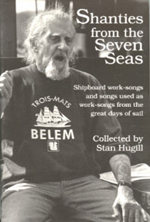 While many of our songs come from Stan Hugill's wonderful resource Shanties from the Seven Seas (republished by Mystic Seaport Museum, 1994) - containing a wealth of information about life at sea during the age of sail, along with the music and lyrics of over 400 sea shanties! - we also collect in the more traditional manner of learning them by listening to other shanty singers, be it on recordings or live. Of course, we always bring our multi-harmonied personal Yarmouth Shantymen touch to our versions of these great work songs from the age of sail.